I never thought that I would be writing a post on how to make Instant Pot Hard Boiled Eggs. I mean, do we really need a recipe on how to make the perfect hard boiled egg? 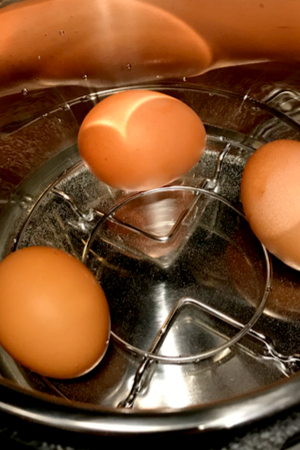 Even fresh brown eggs can peel easily when made instant pot hard boiled eggs. Have you ever tried to make hard boiled eggs and you struggle to peel them. You spend more time and effort to peel the egg only to have half of it stick to the shells. What you end up with is a pitted egg that lost at least a quarter of the whites. You definitely can’t make them into deviled eggs – they look terrible! For those that have tried to take fresh chicken eggs and hard boil them you know how difficult it can be. They don’t peel well at all! This is because the eggs that you actually purchase in the store are most likely already 3-4 weeks old. By the time that they leave the coop, get inspected, packaged and sent out the grocery store they have aged quite a bit. There is nothing more frustrating than trying to peel an egg when half of the egg falls off in pieces too. On the contrary, for those of you who have a local source of fresh eggs may try to make hard boiled eggs within a day or two of them actually being laid. This makes a huge difference in their ability to peel easily! I have had great luck with using a specific boiling method to achieve perfect, easy to peel, hard boiled eggs. I bring a large pot of water to a boil. Once the water is at a rolling boil, I carefully lower each egg individually into the scalding water. After 12 minutes of boiling for store-bought eggs, 15 minutes for fresh eggs that are at least a week old, and 18 minutes for eggs that have been taken from the coop within the week, I will immediately place them in an ice water bath for at least 10 minutes. The old-fashioned way of making hard boiled eggs. The ice water stops the cooking process. And the results, easy to peel, perfectly cooked hard boiled eggs. As you can see, this can be a lengthy process. It can take 10-15 minutes just for the large pot of water to come to a boil. And after that, you have at least another 22 minutes before you can begin the peeling process. 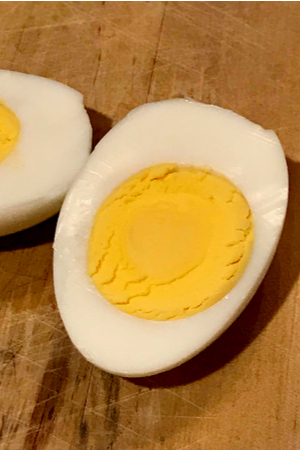 So when I heard that you can make Instant Pot hard boiled eggs, I knew that I had to see what all the rage was about. 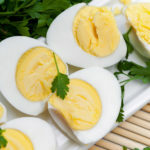 If you have done any research on how to make Instant Pot Hard Boiled Eggs I am sure that you have seen the term 5-5-5. Place your eggs on an egg rack or the trivet of your instant pot. This can be real confusing to a new Instant Pot owner. But don’t worry, once you know the language, you will understand what it means. The first number refers to the cooking time. In this case, 5 minutes on High pressure. The second number is for the natural pressure release time. After the cooking time expires, you will see L0:00 on the display screen. This means that the cooking time is complete and the numbers will begin to count up for every minute that it has been since the cooking time has expired. Don’t do anything until the display reads L0:05. This means that the the pot has had 5 minutes of Natural Pressure Release. Once your instant pot naturally releases for the given time, immediately transfer your eggs into an ice water bath. After those 5 minutes, you will need to release any remaining pressure by turning or pushing the sealing/venting knob. And the last 5, in the 5-5-5 Instant Pot Hard Boiled Eggs method, refers to the amount of time that the eggs need to sit in an ice water bath. 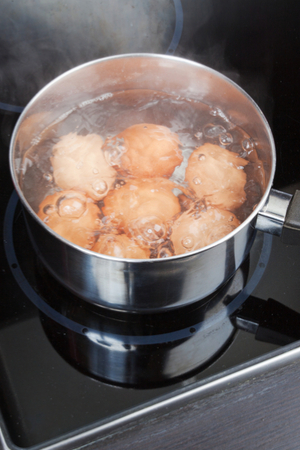 Once all of the pressure has been released, remove the lid and transfer each egg to a prepared ice water bath. 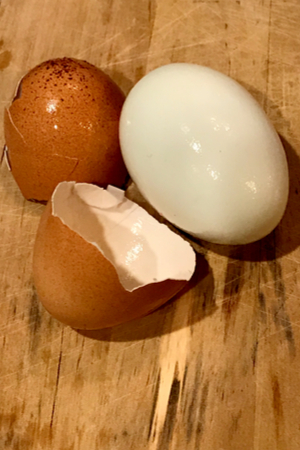 After 5 minutes, you will have easy to peel, Instant Pot hard boiled eggs. Well, maybe……. The peel virtually slips off the egg. Does The 5-5-5 Method Work For Everyone? Just like every recipe, there are adjustments that might need to be made based on several factors. First of all, you have to determine how you like your hard boiled eggs cooked. For some, that means that the yolk is entirely cooked through. But for others, they like their egg yolk with a little gel still left in the center. Next you have the factor of location. Depending on your altitude above sea level, you may have to adjust the cooking time. This is how I like my hard boiled eggs. This is true for almost all recipes that are made in the Instant Pot. And the final determination on if the 5-5-5 cooking method will work for you is the size of your pot. Yes, I have experimented with making Instant Pot Hard Boiled eggs in all three of my Instant pots. And I have definitely found a difference in cooking times based on the size. I like my hard boiled eggs to have a completely cooked yolk with no sign of a green ring around it. The 5-5-5 method works perfectly in my smaller, 3 quart Instant Pot. However, when I have tried the same method in my 6 quart pot, the center isn’t quite cooked all the way through. I have tried it with both room temperature and cold eggs. I have also tried it in 2 different states with 2 different 6 quart Instant Pots. Size might really matter in this case…. The results were consistent – the center of the yolk was darker and still gel-like. However, when I increased the increment times to 6 minutes – the results were spectacular. So now when we make Instant Pot Hard Boiled Eggs in our 6 quart, we use the 6-6-6 method. That is easy enough to remember! And now comes the 8 quart trial. After several attempts we have found success using the 6-10-6 method. I can’t explain why, but it works for us. So unfortunately, I can’t give you an exact recipe that will work for everyone. What I do recommend is that you experiment with 1 or 2 eggs at first until you find the consistency and method that works for you. The actual cooking process is the same no mater how long you pressure cook them. Add the trivet or egg rack to the bottom of the liner of your Instant Pot. Add the required amount of water based on the size of your pot. This egg rack duo will hold up to 18 eggs. Place the eggs on the rack. The amount of eggs that you cook does not affect the cooking time. If you make one egg, or if you put 2 dozen in your pot, there is no need to adjust the time or the amount of water used. If you are new Instant Pot user, please check out our Instant Pot Beginner Tips article on where to start. 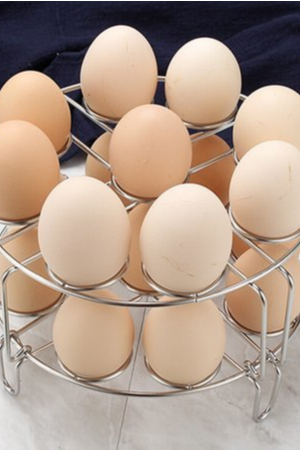 And for those who want to experiment even more….try to color your eggs at the same time that they are cooking! 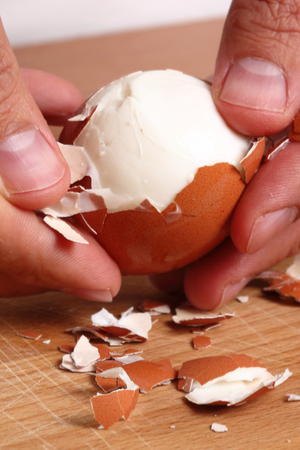 A great way to make easy-to-peel hard boiled eggs. 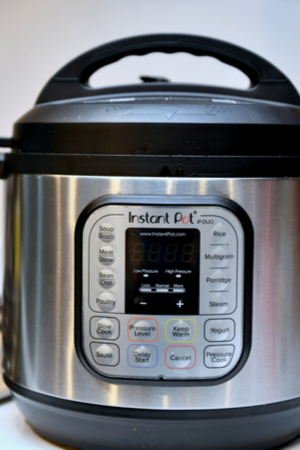 Add the minimum amount of water to the liner of your Instant Pot. Ex. - 6 quart add 1 cup of water. Place the trivet or egg holder in the bottom of the liner. Once the cooking time expires, allow for Natural Pressure Release for 5 minutes. After 5 minutes of Natural Pressure Release, quick release the remaining pressure. 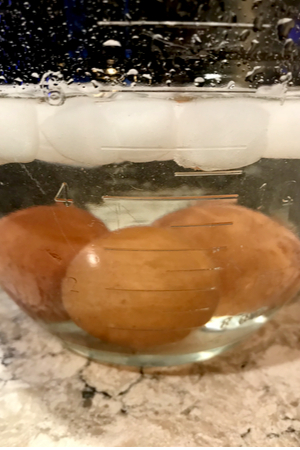 Immediately transfer eggs to a prepared ice water bath for 5 minutes. Peel immediately or store in the refrigerator until ready to use. Allow extra time for the Instant Pot to come to pressure before the cooking time begins. **Cooking time may need to be adjusted based on your preference of hard boiled egg texture. 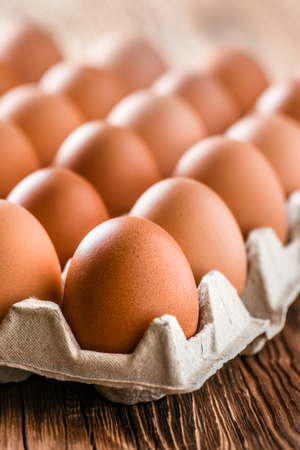 It is recommended that you test this method with 1-2 eggs until you achieve the consistency that you prefer. So glad you mentioned about the egg rack. Only got mine about a month ago and love it. Like all your times shown. That explains some issues I’ve had. Really enjoy your blog. I am so glad that we could help!